When production of the Austin-Healey 3000 ended in 1967, noted driver & designer Donald Healey need another place to put his name, so he worked with Jensen to produce something called the Jensen-Healey. A guy by the name of William Towns ('67 Aston Martin DBS, 74 Aston Martin Lagonda) helped with the design, and a company named Lotus provided the engine...and the rest is history. 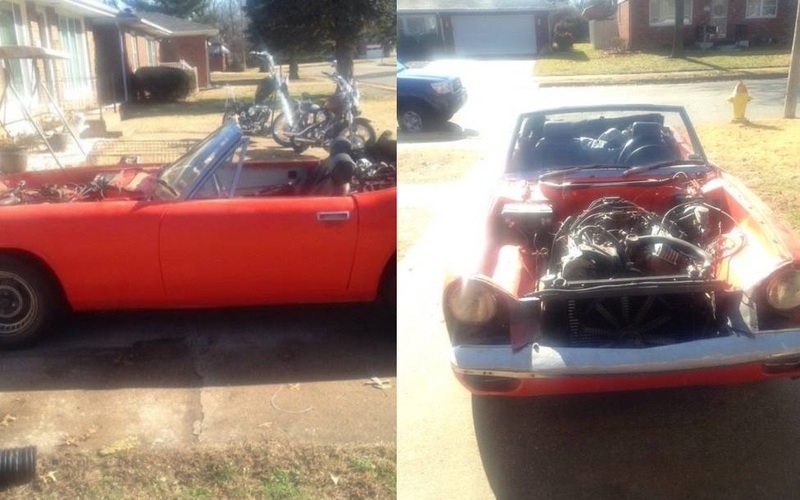 Find this 1973 Jensen-Healey offered for $1,800 in Granite City, MO via craigslist. Tip from Zach Z.
I'm still not sure which part of the Jensen-Healey name is the make and which part is the model...or if it sorta transcends typical automotive nomenclature that has been standard since Oldsmobile released the Model 6C in 1901. Regardless, this Jensen-Healey has ditched its original Lotus DOHC inline-4 and 4-speed manual box in exchange for a 350 cubic inch OHV Chevy V8 mated to an automatic transmission...oh the ignominy! Yikes! My experience is that the "few little things" left to do will take the most time, and likely involve major disassembly of critical components to fix it right. Hope the front springs and rear end can take that kind of weight and power! On the other hand, probably worth the parts if the body is in good shape. Check out Seville Auto Trim by clicking... HERE!